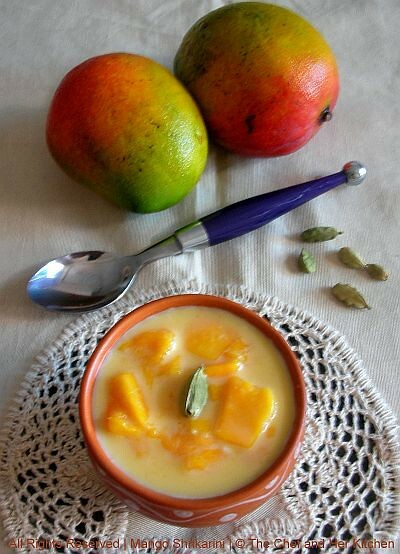 THE CHEF and HER KITCHEN: Shrikarani/Seekarane...a simple Mango delight!!! I know you all might have got confused with the name,even I dont have any clue why it is called with that name but all I know that it is such a delicious dish which we always enjoy through out the summer season.It needs very less ingredients and takes just a couple of minutes to prepare and tastes best when paired with hot chapathis smeared with ghee.The mango chunks with cardamom flavor in every bite takes us to heaven,if we run this mixture in mixie it will turn into mango Milkshake.But believe me this chunky mango delight goes very well with hot chapathis,this does not taste good with rotis. I prepare this one I do not require any side dish for my chapathis. Clean and remove the outer layer of Mangoes and finely chop it.Mash half the portion of chopped mangoes with a spoon slightly,hand does a better job here. Mix sugar and milk until the sugar is melted completely. Add mashed and chopped mangoes and Elaichi powder to it and mix well. Chill it for half an hour in refrigerator. Serve it cold as a dessert or a side dish with hot hot chapathis. Enjoy the Summer with this simple and delicious dish like me...!! this also goes to " WYF:Quick Meal" Event by EC. Prathy i was wondering what it is seeing the name. so reading the recipe understood like it is paravannam which I used to do. but u have said serve with hot chapathy wow that is really very very new to me and just waiting to try that soon. THats really variation ...will try it out. New and unusual combo recipe! Looks healthy! 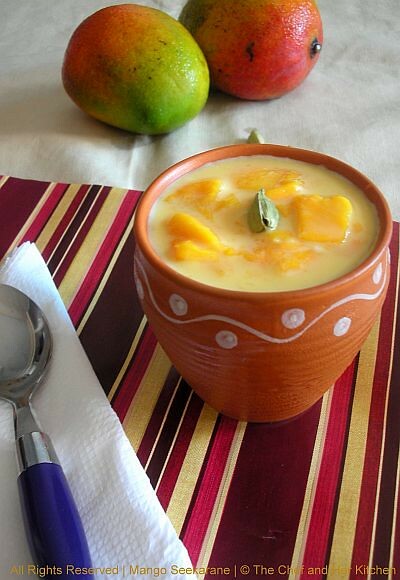 simple and yummy one..Love any dish with mangoes.. I think that's a very pretty name and the dish looks fabulous. Love everything with mangoes. very colorful, yummy and a different one! simple and delicious dear...it has turned out really good! Fabulous, gorgeous and awesome dessert Prathibha!! I think i will eat them like that than with chapathies. Looks relaly yummy delicous. First time I've heard about this dish! Looks great and a must try! 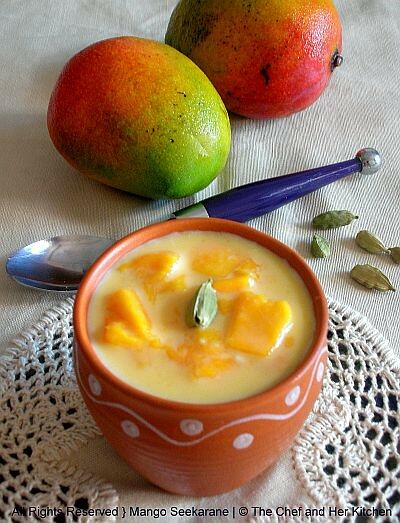 Initially I thought Shrikand..but this is no less yum..anything with mangoes n I am in..:D..looks too good Pratibha.. Unique dish and looks yum! This is the first time I've come across this name/dish. Where is it from? @sra This is the name we call it in bangalore. Ooooh.. just today I was wondering what to do with my 6 mangoes that I bought last week.. Perfect recipe Prathiba! I'm gonna try yours soon..
Definitely try it out sujatha, it will be really yummy..